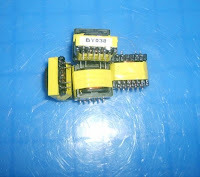 Trying to build a D.I.Y Geiger Counter, I have been experimenting with various circuits to generate the High Voltage that Geiger-Mueller Tubes require (most operate around 500V D.C) . There are many circuit diagrams out on the net. I've built several. 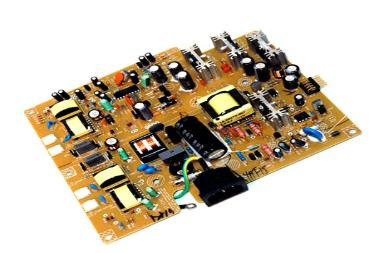 One challenge is finding a proper coil (or transformer) that has the right properties to let the inverter function in the way the voltage boost is sufficient. Another challenge is stabilizing the high voltage and lastly have a low current consumption (for battery use). During my experiments, some circuits required more than 150mA @ 5V D.C this is definitely too much for battery use. Others were a lot more conservative, but could not generate sufficiently high voltage (just 450V D.C, just the low threshold of the G.M. tube I have, but I prefer operating the tube at the center of the plateau). I didn't have good results with the diode-cascade type of voltage-doubling. In the end, I had good result with a circuit, built with a CCFL (backlight) H.V. Transformer scrapped from a power-supply board of a (defective) Dell or BenQ TFT Monitor. 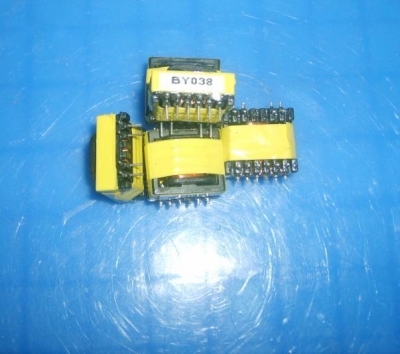 On this board, there are also some very good Transistors 2SC5707, designed for switchmode circuits. I used one of these as oscillator for my HV inverter circuit. In my experimental setup, the circuit draws just a few milliamps out of a 5V supply, delivering 550V to a G.M. Tube FLZ76V. The complete D.I.Y Geiger Counter circuit, with PIC16F628A microcontroller and a 16x2 LCD screen draws 5mA from 5V D.C. Your mileage may vary, depending on differences and tolerances of the components used. I've finally built a complete HV inverter unit on a piece of experiment board (PCB with holes on a 2.54mm grid). I'll use it with the SI-8B pancake tube, so the HV output is adjusted to 400V (using 4 times 100V zeners in the regulation feedback line). The unit (unloaded) draws just 250µA off a 5V supply. Loaded with a 4M7 resistor, the output is still 390V. So far, this is the most efficient HV inverter i've built. The HV output side. A 4M7 anode series resistor for the GM tube already mounted as well as a 2k2 kathode resistor (for pulse detection). This seems to be a very nice circuit. Do you know if the transformer is a generic part? I picked up an inverter from the junkbox here and it has the same amount of pins (6 primary, 4 secondary) and looks practically the same. Re. the transistors: others will probably work too (it's just an oscillator circuit working at around 50-60kHz), but I got the best results with this type. Good luck with building and let me know your results please.